As it has become more and more apparent that the North American pack lines are becoming limited, we knew we needed a new bloodline. 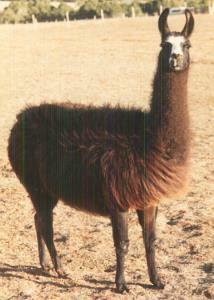 Our classic breeding program emphasizes athletic and well conformed llamas. We have always admired Redwood Llamas Clancy. 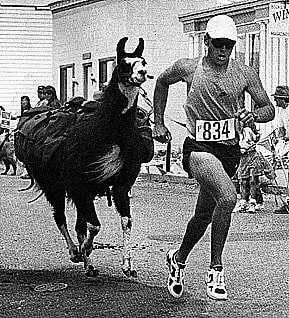 A llama who competed in many marathons (Fairplay Races, Llamathon etc.) through the years and was always highlighted as an exceptional athlete. After talking to Bill for several years about obtaining this line, we finally made arrangements in the Summer of 2016 to go look at his herd. At that time we expected to come home with one of the Clancy granddaughters in his herd. After looking at and talking through our options, we chose Redwood's Gert. Gert is a direct daughter of Clancy and out of an Oliver Twists daughter. Llama bloodlines do NOT get any older than this! The icing on the cake was that Gert at age 19 still looked fabulous and was definitely still worthy of breeding. Our only hope was to get a male offspring from her and our outcross classic male CTL Sulu. We knew this would be a long shot as both of them are pretty old and Gert had not had a baby in several years. In September 2017, Gert gave birth to a beautiful and healthy male. JNK Sulu's Huxley MT looks to have the conformation and temperament so far to be a future herdsire. We are overjoyed and hope he will be our next classic herdsire. To have these strong and proven lines added to our program has us doing a big happy dance! Honestly, it is just an honor to have a llama from these old well respected lines. We will not be selling any of Gert's offspring. Most llamas should not be bred at this age, but we are very careful and are taking exceptional care of Gert prior to and during her pregnancy. After a tragic accident took our female Rocky Mountain Inca's Legacy Lady, Gert took on the nursing and raising of her baby who was only two weeks older than Gert's own. Suffice to say she is a good mom with lots of milk! The November 1994 Sports Illustrated ran this story on Clancy!